Does Detroit Need A BMW-Style Car Theme Park? 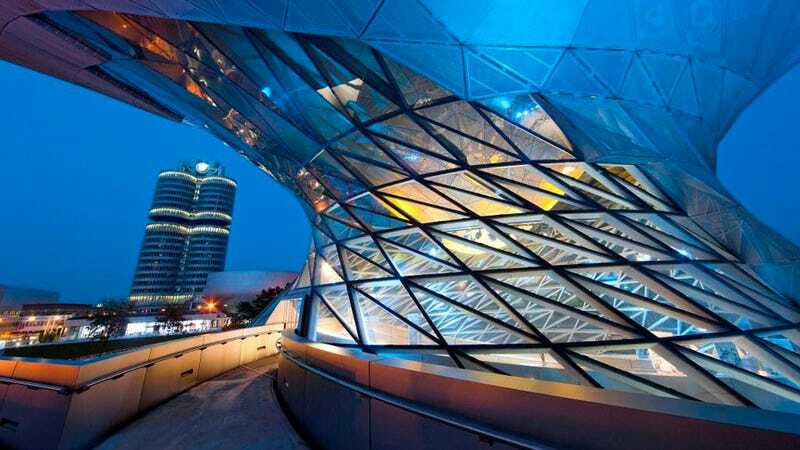 BMW Welt is something between a museum, a factory tour, and an amusement park. Now several Detroit businessmen think Motor City should have something like it. The three businessmen are Dan Gilbert, Bill Ford, and Roger Penske, reports the Detroit Free Press. Bill Ford you know as the executive chairman of Ford, and Penske you know as the owner of 326 auto dealerships and more racing teams than we can count. Gilbert, the chairman of Quicken Loans and owner of the Cleveland Cavaliers, is the man behind the as-yet-undeveloped proposal. Gilbert believes Detroit needs something like the famous BMW-Welt or Mercedes World. These German centers offer full attractions to many visitors, showing off the high-tech ballet of their assembly lines and putting absolutely gorgeous classic cars on display, all in stunning pieces of architecture. The Mercedes World outside of London even offers test drives of supercars and off roaders to adults and under-16 kids. Much as Detroit has had nothing to match German cars for the past few decades (recent years excluded), Detroit has had nothing to match these German car centers. Gilbert vented his frustration to the Free Press, saying, "Let's be frank and honest. Detroit blew it for decades and decades when it came to leveraging the sexiness of the automobile." Bill Ford has spoken with Gilbert, and agrees that there should be something like BMW and Mercedes' Worlds saying, "we agree, it would be cool to have something big like that in Detroit," Ford said. "The question is, 'What exactly is it? What does it look like? And what would our contribution (from Ford) be to it?' A lot of our history is already in the Henry Ford" museum complex in Dearborn." Penske made the point that brand-specific museums just aren't working for Detroit, telling the Free Press, "There's no question the Henry Ford museum brings the heritage, but there are also so many modern things taking place, so much technology in the concept cars at the auto shows, there's a lot we can put downtown — and that would drive people into our city and drive commerce, which is what we need." There's no question that past and current efforts to capture the joy of the automotive experience have fallen flat. Disney's car ride at Epcot was behind the times before an extensive, butChevy-exclusive redesign, and Detroit's last effort at a multi-brand attraction, the Flint AutoWorld of the 1980s, was an $80 million flop. Detroit has shown it can run an automotive attraction that includes all makes with the annual Woodward Dream Cruise, a massive success. BMW and Mercedes have shown that something more dynamic than a car museum can be a popular tourist destination and a point of pride for an industry. That said, Gilbert, Ford, and Penske have a long way to go before they bring the two ideas together.